The University of Toronto’s Joseph Jay Williams (photo right) is using computer science methods to enhance education. 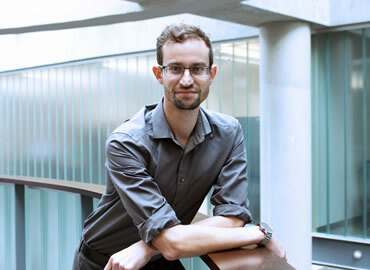 “We need scalable methods for analyzing data and figuring out what works for learners, but these algorithmic methods have to be combined with human intelligence – like allowing instructors to provide ideas,” says Williams, who joined U of T’s department of computer science as an assistant professor this summer. It’s a homecoming of sorts for Williams, whose undergraduate studies were at U of T, in University College’s cognitive science and artificial intelligence program, which combines courses in computer science and psychology. He had an opportunity to take a course with University Professor Emeritus Geoffrey Hinton, and the U of T program led him to a PhD in computational cognitive science at University of California, Berkeley. Williams investigates how people learn by explaining ‘why?’, as well as applying statistics and machine learning to modeling how people think. His approach includes designing randomized experiments, also known as A/B testing, to see what is helping students learn and involving instructors in this process. Students learn from an instructor explaining a problem, but having students generate explanations themselves, such as explaining why they think an answer is correct, can be especially helpful, he says. The key is to unpack the mechanisms that underlie learning, says Williams, which makes learners better at solving new problems. He says that it’s a pity that A/B testing is used to improve a consumer product, but not as commonly used to improve education. He applies algorithms from machine learning, a subfield of artificial intelligence that allows computers to process, analyze and make decisions from data, to analyze A/B experiments, and provide better conditions to future learners. In his paper, Enhancing Online Problems Through Instructor-Centered Tools for Randomized Experiments, three Harvard University instructors ran randomized A/B comparisons in the student portal to see what kind of explanations or feedback messages students found helpful. William says one instructor designed different feedback messages, for example, ‘when you get this question wrong, think back to an earlier lesson’, allowing him to compare that approach to simply telling students why their answer wasn’t correct. It’s at this juncture that Williams thinks machine learning can be applied to testing in real-time and determine what’s most effective for learners. For example, Williams says A/B testing has been used for MOOCs, or Massive Open Online Courses. When resources are digital and cloud-based, it’s easy to compare alternative versions, and data is readily available, he says. Algorithms can be run dynamically to discover what’s effective, providing a much faster process than was possible ten or twenty years ago, with studies taking place in physical classrooms or labs. Another part of Williams’s research addresses health behavior change. While it’s easy to say that people should exercise more and perhaps eat less sugar, Williams says A/B testing through technology can help discover exactly what messages or encouragement get people to change their behavior.